I was at a workshop recently where senior scholars (somehow I was in that category) were asked to offer advice to a group of junior scholars in our field. At one point, I was telling some of the junior scholars how I've benefited by drawing on and learning from Meta DuEwa Jones and Evie Shockley. They're my peers, and they've also served as guides, unofficial mentors, and older sisters. They're both poets, scholars, poet-scholars, and scholar-poets. Take your pick. I've written quite a bit about Evie's poetry, but she and Meta have often imparted scholarly ideas as well. They've passed those ideas on to me at conferences and through their writings. 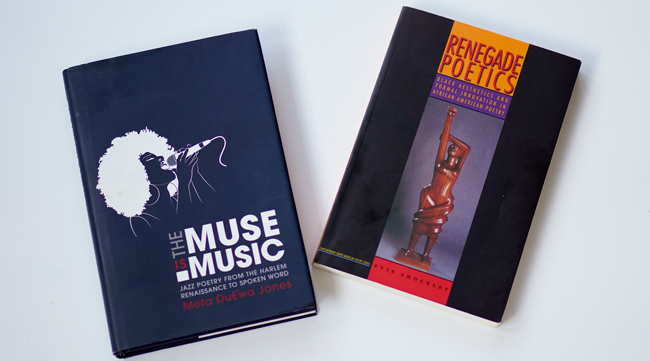 Among various articles, Evie published Renegade Poetics: Black Aesthetics and Formal Innovation in African American Poetry (2011) and Meta published The Muse Is Music: Jazz Poetry from the Harlem Renaissance to Spoken Word (2012). Both books have been useful to my thinking on poetry over the years.